As you know, I’ve been working through Late Harvest – an embroidery design from Hazel Blomkamp that can be found in her book Crewel Intentions. I’ve been making pretty decent progress on it (and having a lot of fun with it! ), pretty much because it’s the only project I’ve got out right now. While I’d like to be working on some other projects, and while I need to be working on some other projects, I find myself taking the Path of Least Resistance. It’s just easier to work on what’s right in front of me instead of going through the set-up phases on other projects. One of these days, I’ll snap out of my Lazy Mode. But in the meantime, I justify it by telling myself that at least I’m getting something done with my needle and thread. Gosh, I’m good at justifying these things! As I’ve worked through different parts of the project, I’ve found myself contemplating a few things. We’ve already discussed some of them, like changing the order of work. In one prolonged moment of stitching reverie last week, I found myself contemplating the subject of levels of embroidery. To demonstrate where my thoughts are going on the subject of levels of embroidery, I’ll use this little flower element from Late Harvest. I wrote about the large bead in the middle of the flower quite a while ago, when discussing the order of stitching on some of the larger leaves. I was super excited to work that big fat bead in the middle of the flower. I followed the instructions on it, working the big bead first. Normally, on a motif of this shape and design, I’d stitch the farthest back elements first (that would be the leaves), the next farthest back element next (that would be the petals) and the closest element to the viewer last (that would be the large bead). This order makes sense to me, and it’s logical. The stitching on each element builds above and on top of the previous element. But there’s a reason why the large bead is worked first. When you attach the bead using the method in this design, you have to make a lot of stitches over and through that bead and into the fabric, to cover the bead with thread. And the stitching gets pretty heavy around the base of the bead, going into the fabric. The stitching gets pretty tight around the base of the bead. 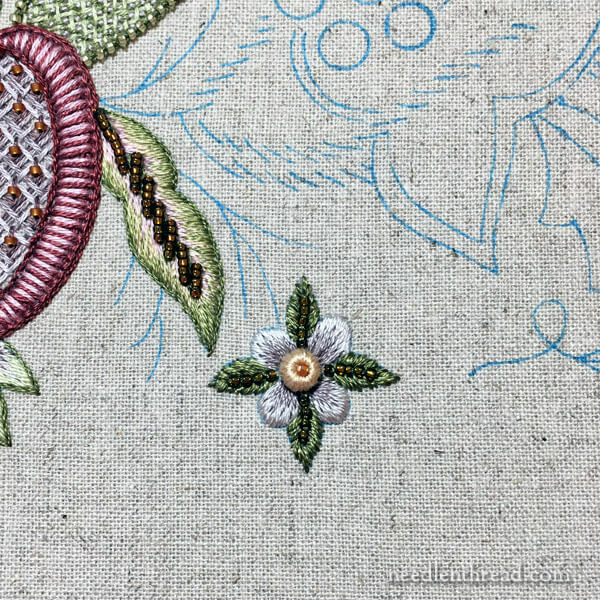 Additionally, the tiny green leaves in the back of the motif have a tiny bead vein running down their centers, and they all converge at the base of the large bead. If those veins are in place when stitching the large bead into place, working the heavier and bulkier stitching that covers the large bead without disturbing the little beads on the veins and the stitches on the petals would be somewhat difficult. At the same time, I’ll tell you this: stitching the little leaves and the petals was a pain in the neck! With the large bead already in place, my thread kept catching around it, and I had to scoot stitches underneath the bead, where the stitching was already pretty tight and heavy. There are several more of these little flowers scattered across Late Harvest, and they’re all worked pretty much the same way. When I come to the next one, I’ll be stitching it in a different order. But I can do that now, and confidently, because I know what to expect out of this little flower, and in my mind, I’ve already troubleshot my way through it. And this brings me to the notion of embroidery levels. I’m not going to have a problem tackling this little flower in other places on Late Harvest. But I’ve been embroidering for a long time, and I’m pretty good at troubleshooting my way through embroidery difficulties. A beginner, on the other hand, wouldn’t necessarily know how to tackle an element like this, or how to change the approach if the element were particularly difficult to stitch. And that’s why embroidery designs and kits are often classified according to level: beginner, intermediate, advanced. Levels, on the other hand, can be rather flexible, pretty subjective, and sometimes, downright misleading. Beginner: Very little or no experience in embroidery; experience is limited to basic stitches. Intermediate: Some experience in embroidery, knows the basics shared by most embroidery projects (like framing up, transferring designs, starting and ending threads, common stitches), has embroidered quite a few projects, and can interpret and follow written instructions well. Advanced: Has had wide experience in embroidery and in a variety of embroidery techniques, is proficient in embroidery, and can tackle with confidence pretty much anything with needle and thread, even techniques not experienced previously. But within those classifications, there are nuances. There are Levels within Levels. Me: What level of audience would you like me to write for? Beginner embroiderers? Intermediate embroiderers? Advanced embroiderers? Her: Think of your audience as the advanced intermediate beginner. Me: Hmmmm. Could you define that? What exactly IS an advanced intermediate beginner? Her: Someone who isn’t necessarily a beginner. Well, that was clear as mud! You see, levels can be very subjective. I’d classify this project as an intermediate project, or even intermediate-advanced. There are several places where I’ve had to troubleshoot and make decisions that a beginner embroiderer wouldn’t know could be made, or even what kind of decisions to make. On the other hand, I’m the type of person who says that anyone can do anything, if you really want to do it. Think you can, think you can’t – either way, you’re right. So, in my classification of levels of embroidery, I like to include one that I call The Determined Beginner. The Determined Beginner is the beginner who might know very little embroidery, who is familiar with the very basics and that’s about it, and who suddenly sees a project and has an overwhelming desire to work it, regardless of its level. Can that person tackle an “advanced” embroidery project? Yes, I believe so. With determination and common sense and the abilities to troubleshoot and persevere, yes, I think Determined Beginners can tackle even advanced projects. And those advanced projects can become the best learning tools they’ll ever experience. I also believe that, unless you actually push yourself beyond whatever you consider your current “level” to be, you won’t really advance in skill and confidence. But a lot of this has to do with desire, with motivation. You really have to want to do it. Otherwise, an advanced project can become a seedbed of discontent and frustration. It can become the reason you never embroider again. What are your thoughts on embroidery levels and classifications? Do you consider yourself a certain level of embroiderer? Have you ever steered away from something you wanted to stitch, because the “level label” associated with it intimidated you? Have you ever taken on a project that you really wanted to do, even though you considered it beyond your current level of stitching? Or do you just not bother with the whole concept of levels? I fall pretty much in the latter camp. I don’t normally think about levels, because they can be super duper subjective and even misleading. What one designer considers advanced, another designer may consider almost basic, and visa-versa. Unless designers and organizations actually define their terms when labeling something according to a level, the labels really don’t mean a lot. My advice to those who look at level labels: don’t be intimidated by them. Think of what you know, what you can handle, whether or not you’re good at figuring things out on your own, and how badly you want to do the thing…and go from there. If you have any thoughts and insights on labels, feel free to join the conversation below! 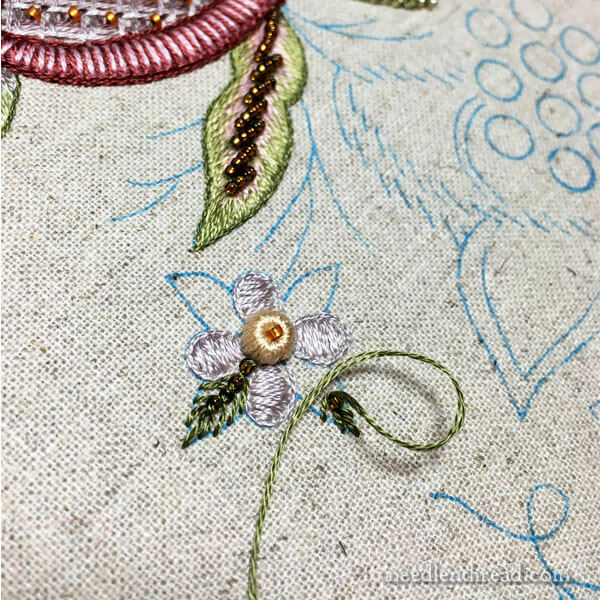 I think the flower might be a little easier to stitch if you use a Stumpwork technique to cover the bead. I have a video on YouTube https://www.youtube.com/watch?v=JXGUa5i-e7I that demonstrates the technique. If you use that method, you can stitch the leaves and petals first and then add the covered bead for the center. Hi, Celeste – It’s pretty much the same idea, except Hazel uses the wrapping part to also fix the bead to the fabric, which is nice, because it eliminates a step. The results are pretty much the same. She uses a double thread, so it covers the bead really quickly. It’s a small space, though, so those stitches do get a little tight under the bead. I like the fact that the bead is covered and stitched on all in one movement. So, again, it works well for this particular flower. If I were bunching together covered beads, or I wanted the bead to lie in a different direction (so the hole isn’t perpendicular to the fabric) the separately wrapped bead would definitely be the way to go! I don’t let the classifications and levels deter me from doing a project. If I like what I see, I’ll figure it out and learn something in the process. Great post! You’re not a beginner of any description. Your work is gorgeous! I always try to avoid labels about myself as i find the label can constrict my creative progress. I do thank the designers though, for being compassionate thinkers in labeling their products. I think people are going to try projects with varying levels of difficulty no matter what classification their own skills may fall under. In the crafting industry, beginner means easy, intermediate means you’ve got a good grasp of the skills, and advanced means you could basically go pro. Which is fine, but who cares? I’ve taught beginner classes in which half the students were highly skilled and wanted a refresher course to brush up their skills, and I’ve taught advanced courses where a handful of absolute beginners did remarkable work. I figure that if someone is determined to learn, they will. I have never looked at levels. I have always felt that if it required a needle and thread then it was for me and could be mastered.. I never looked at a project and said I couldn’t do it. Everything is a learning process and can be mastered. I find that the level of instruction is almost more important than the type of stitching, when it comes to determining level. From what you’ve said, there’s a good level of stitch order instructions, which would help a determined beginner. Stitches can often be looked up in a reference (assuming someone knows how to find them online or in the library) but knowing what order to do things in, as you’ve been explaining, is the real key in more complex projects. I wonder if that’s a better description – instruction level/complexity level. Beginner/simple is a single flower with only a couple stitches, beginner/complex has more stitches, but everything is described in the instructions. Advanced/complex would be something like “Late Harvest” with minimal working directions. You’re description so far makes it sound intermediate/complex – a lot going on, but a reasonable amount of guidance built in. I think that if a beginner loves a project they will work at getting their skills to a point where they can accomplish what they love. Let me begin by saying once again how much I enjoy your website and look forward to it every day. I call it my embroidery fix! As for your question of level skills, I’m am of the mindset that if I come across something that really appeals to me, I will tackle it. I will ponder, consider, ask questions and use my own imagination to conquer the problem. To me, this is how you grow and learn and there is great satisfaction in conquering an obstacle. That being said I will qualify it somewhat by saying that if I feel a project way beyond my capabilities I will put it to one side till I feel I’m ready mentally and physically to meet the challenge. I hope your health issues are under control and you will be writing your blog for many years to come. It is hard to categorize. I think of myself as advanced, because I know a lot of stitches, how to do them, can follow directions easily and know what they mean, transfer designs, etc. etc. I think there needs to be one more level though – EXPERT or DESIGNER. My work is good, but not to the level of yours! I consider myself a advanced beginner. I could not do the Enchanted a Garden project, so dropped out fairly quickly. My problem is that I don’t know what stitches to use on a more complex project. Another important question for beginners to consider: Is help available from the source of purchase, the designer, or an experienced fellow embroidered if I get stuck? I haven’t really paid attention to labels on kits because most of what has been available has been pretty simple. I worry about my skills being not up to snuff when I see expensive thread or linen. While I have ideas about potential projects I don’t want to let the materials down or waste them. It’s silly, but I keep thinking I just need to stick to cotton and standard embroidery floss until I’m “ready”-whatever that means. You’re going through a lot and need to rest and recouperate. I’m intermediate, or determined intermediate. I was definitely a determined beginner and i will tackle any and all projects regardless of level! My finished piece wouldn’t be as good as yours but i’m not trying to get an exhibition or be a professional, i embroider for the love of it and i will try all techniques at some point. I’m going on a Caselguidi course next month and i’m really excited! Examine the project. Degree of blended shading? Level of pulled work. Stump work complexity? With which I am less comfortable. Design. Use your doodle cloth as well as look at online tutorials. Learning is best done from trying and making mistakes. This is not world peace – it is cloth and thread..
It’s the process, the problem solving and the skill building that I enjoy the most with any needlework project, not necessarily the finished item. Many of my finished pieces are bestowed upon admiring friends. So, in essence, I am always a beginner. Assigning levels to a project, to me, is meaningless. Would I tackle the pearl embellished picture mat? Of course I would. Let me put it on my list…..
By the way, I am looking forward to your commentary on the next big bead, Mary! Thank you for an insightful, cheerful, and heartfelt blog. As they say in French – a person who is still not very good at a subject but isnt starting for the first time is a ‘false debutante’ !! I love this post, thank you very much. From my point of view, your determination is most important in choosing a project. And then: be honest with yourself. If your eyesight isn’t great and you don’t like working with a magnifier, than don’t bother with fine work. And while it is ok to strive for best, don’t necessarily compare yourself with the model provided by the designer or teacher. They usually have far more practice than you and that’s ok. Strive for honing your skill, learn something new and, most important, have fun. I jump right in regardless of level. I tend to not be interested in beginner pieces, I like a challenge and complexity! If I like a project I will just do it. I figure that if someone else did it, so can I, so I don’t limited myself by being intimidated. My first counted cross stitch project over 30 years ago had fractional stitches, outlining, metallic threads and beads on 18 count. Last week I did my first piece on 40 count! Mary… I think the size of your “stash” of embroidery threads and tools also must be considered when determining “levels” for completing a project. I have a wonderful stash of DMC threads and lots of hoops, scissors, etc. So, in many ways I think of myself as an “advanced intermediate” embroiderer. However, recently I signed up for the Goldwork Caftsy class and paid a special fee of $20 (I thought that was an incredibly wonderful price!). While something I read said that this was an “intermediate” level class…beginners were welcome. So I printed out the supplies/directions and watched the first few lessons. I quickly determined that I did not have any stash at all for Goldwork! So I went onto the web to research Internet shops where I could buy items for this new embroidery technique…and I found that I could pay more than $100 or more to begin that “stash.” Yes, I might only need a little of this type of Goldwork supply, but I could not buy “just a little” to use in this class…I had to buy a whole bunch of something…so that meant that I was starting a “stash” for future Goldwork. 2) Should I view the Craftsy Lessons and just enjoy the experience? Will I be disappointed that I did not try out the different skills in this wonderful embroidery technique? UM…. Right now, I have just enjoyed viewing the lessons…and as of a few weeks ago someone asked if the teacher could create a supplies packet that we could pay for that only included the “little bits” of Goldwork supplies…and she was thinking about it! So, supplies — or lack of supplies — might also be considered when thinking of assigning a “level” to projects…don’t you think? I did the same. Love the look of the gold work and would love to try but supply’s were way out of my reach. So I have looked and enjoyed. I,motto bought the Craftsy goldwork class, as well as that on stumpwork, though I’ve yet to begin either. As I view the foray into goldwork as probably a one- or two-time venture, I would be reluctant to spend that much for supplies. Though I entertain the thought that I might reconsider this, having a pre-assembled supply kit would definitely appeal to me too. Perhaps your best bet would be to buy a kit to try. In the UK we have several suppliers who produce kits for beginners upwards, try http://www.golden-hinde.co.uk ; Janice Williams produces taster kits of small amounts of threads, purl and leather – see thegoldworkguild.com/supplies.html or I’m sure there will be someone similar in your country. Thanks, Joy, for the idea to get a goldwork “beginner kit” and the weblinks. I just spent some time looking through both websites and their kits are just wonderful! I appreciate your message! I’m on the same course and got good news for you! The instructor, Lucy Barter, is currently making a kit for the class. You can ask more details directly from her: lucy@forever-emb.com. I am so H*A*P*P*Y that the Craftsy instructor might make a kit for those of us with no goldwork stash. And, Noelle, Tanja Berlin’s website is rich! Plus, what a great idea to buy an older kit from eBay and just follow the Craftsy class on “how to” for the stitches in the eBay kit! Thanks to everyone for sharing these great ideas! I am the type who likes to tackle projects if I really like the look of it. I haven’t embroidered in a while and recently came across a project for a 12 Days of Christmas calendar and have had to refresh my memory on some of the stitches. In one area it calls for a particular stitch and for the life of me I can’t make it look good therefore, I decided to use another stitch instead and think it will work just fine. I will just have to wait and see how it turns out. I think there is a lot of be said about the quality (and amount) of instruction that goes along with a project. The better the instruction, the easier (more successful) a stitcher will be! And most (I think) projects can be completed to the best efforts of the stitcher.. The “perfection” level may differ between embroiderers, which might reflect on their amount of experience in needlework. But if you don’t DO IT, you won’t get further experience!! SO: if you want it, GO FOR IT!!! I go to a lot of the Smocking Arts Guild (SAGA) conventions and take the classes offered there. Most of them say beginning, so I shy away from them, as I want to learn more advanced techniques. But I found that even though the course may say it is for, shall we say, advanced intermediate beginners, it sometimes is much more advanced that the description calls for. This causes problems because sometimes rank beginners will take the class and monopolize the teacher’s time because she doesn’t know what she is doing. While I would encourage everyone to take classes to challenge herself to do something she would otherwise not do, it isn’t fair to those who really are ready to take the more advanced classes. I’d like to try one of Hazel’s projects. It sounds as though her instructions are very detailed. Oh I jump in where others fear to tread! If I really like a project. More often than not I pull it off – but that is down to belonging to an embroidery group with other more experienced stitches who are wiling to give advice and help. I think as long as someone has mastered the basic skills and knows how to follow directions, nothing is too advanced to try. My Mom taught me to sew as a child, so when I decided to do beading, embroidery and crewel, I began with kits and chose patterns that included a bigger variety of stitches to make it more fun. People have different learning styles, so some would prefer a class over a book or magazine. I was about eight when I started choosing my own projects. I have mainly done counted work lately, but your current project makes me want to embroider again. I was disappointed that many of my crewel projects didn’t hold up against moths (or something – some of the wool just seemed to disappear), so I’d like to try with cotton or silk floss. I find that I do not classify myself at the level that others do. I do needle painting, sort of… I use a variety of stitches for fill and to add texture to the motifs. I use my own drawings for designs. I see all my oops and faults, others often see none of them. So, am I advanced? or advanced beginner? Since I love working new stitches??? it’s always a question. I don’t let level labels determine what I do – I let interest do so. That being said, I stuck with cross-stitch a long time because I knew if I wanted to try new stitches, I could always get a sampler. The only ‘free embroidery’ technique I knew of was split stitch, something that is very common for decorating SCA-historical garb in this area. I don’t let labels intimidate me, they encourage me to go to the next level. I want to try bullion stitches but haven’t yet but I did try the Turkish stitch for a cats fur and I loved the results. It was a stitch I never heard of until you posted about it. Anything I see and want to attempt I practice on scrap fabric until I feel comfortable about putting it on a project. I think most people will attempt something no matter the label it’s given. Beginners need to take baby steps and those more advanced are probably looking for something new or more challenging also. A mix of techniques for all levels is most useful so no one is left out. I think you deliver that to all of us. We can check your archives as we progress which is nice because I may not be ready for a technique now but in months or a year I may be ready to tackle something much harder and it will be available. I hope your recovery is progressing as quickly as your embroidery! Last year I attended the EGA convention in Phoenix. Oh, Joy, it was in my local area, however, there were very few classes for beginners. I signed up for 2 which seemed ones I could handle. Both teachers were superb, but I was way over my hear in one of the classes. My plea. When organizing these national events, please consider that entry level classes would encourage more “newbies” to try the art of embroidery. Yes, I think “determined beginner” is a good definition of me when I started Brazilian embroidery! I had the rudiments of basic embroidery but I dove in with determination! I took some classes during the June seminar that were above my level but I persevered (and the instructor did too!). I also tend to do projects above my current skill level but I take my time and am happy with the results. I have been blessed by being able to stitch for a time with a group of other stitchers who helped me through the rough spots with patience and understanding – a rich blessing indeed! I get lots of compliments on my embroidery. “I love that!” “You do beautiful work!” “So detailed – this is terrific!” I am a regular reader here as well as other sites Mary has pointed us to, and I can tell you I know NOTHING. I am terrible, I am two levels below a beginner, I am really really bad at embroidery. That is, when I compare myself to others. But at the same time this site and others spur me on, inspires me, gives me ideas, and challenges me. And I love that. I love that Mary teaches us things and shows us things and describes things and points us to things that will inspire and challenge us. I have often thought there are levels to the basic “Beginning, Intermediate, Advanced” levels for embroidery. I don’t know where I am on that scale, but my goal is to always move forward, try new things, new techniques, and be as creative as I want with my needle and thread. I am good — but I can be (and want to be) better at embroidery. Thanks as always, Mary, for this site and all you do. To me, half of the fun of a project comes from figuring out how techniques are done that I have not tried before. I especially enjoy working from old embroidery, books and pictures with little (or nothing) in the way of instructions, tips or lists of materials, learning by doing, working samples and try-outs until I’ve ‘got it’. I guess that makes me an expert beginner by now! Intermediates can manage with a little less help and guidance, but should still get fairly comprehensive information about what thread to use where, with what stitch and the best order to do the work in. They may have a blind stop somewhere, or be aiming a little above their real level. Anything a little bit unusual in the project still needs very clear step by step explaining. Advanced stitchers ought to be able to cope with anything basic. But common sense isn’t that common, and it’s still probably best to err on the explanatory side rather than risk them being frustrated and discouraged rather than engaged. I also think it’s good to gently encourage all stitchers into independent work and experiment, which many kits and patterns don’t try to do. (Some stitchers remain happy with kits, and that’s fair enough, but there’s so much more fun to be had out there in Needleland!) So I like to try to pass on a little of the reasoning behind things like order of work and choice of stitches, rather than just saying ‘do this, then do that’: in the hope of giving them the ‘feel’ for a particular style or technique. Then it can become part of the stitcher’s repertoire, to use as he or she fancies in their own designs or adaptions, later on. (It’s also a big help when they meet a less informative pattern elsewhere.) These extras may not be essential in any level of kit or pattern, but if there’s room for them, they can only help and perhaps inspire. First of all I love opening up to your blog. I also d not absolutely follow level advice. I am a beginner – did my first embroidery by sight and your u-tube tutorials. However that first embroidery blew both me and all my friends away with the detail. So …… My way now is to go with something because it inspires me to. There are many surface embroidery styles and last year I finally admitted to myself that I do not have to attempt nor enjoy working all forms of surface embroidery. I took a deep breath and said, Enough, you love everything crewel whether using fabric or creating paper cards. Acknowledging that some forms, for me, will forever be in the beginner level went against the grain but allowed me to move to a higher level. A true beginner often follows kit instructions not knowing there are different levels of working a stitch, choices of fabrics, threads, helpful tools, etc. It has taken me decades to become an advanced intermediate embroider. My mother started me on the road to embroidery, years and life went by, and I returned to embroidery. Today when I mention how much I enjoy working crewel often the reply is, Oh, I did that long ago . . . Like these ladies I had always adhered to the written instruction provided in the kit. Where are the informal, local groups that sit, stitch, chat and teach the novice? Through Needle ‘N Thread I learned of higher level techniques and Mary, I want to add, your book reviews are helpful. If I had not found these resources I would not have progressed to higher levels. Finally, I am usually able to troubleshot and work my way through problems. My current project is a kit project, love the fabric, love the design, love the wool yarn colors. Along the way a budding wool allergy became full blown – swollen eyes, itchy throat, running nose. After a dose of allergy pills I did a marathon frogging of the wool. Would my ripping beat the allergy pill effectiveness? Then the fabric was set outside in the sun and air to blow off any stray snips of yarn. Now I am working the lovely crewel design in cotton floss, (mostly DMC). I’m on my own to chose colors, how many threads for a stitch, even to change a stitch that works better with cotton floss. I plan to share the finished project on stitchinfingers.ning.com. This website is another place to find inspiration and help. Mary, you have inspired me to get my stash of beads out and add some to this design. Who says the designer did not have beads in mind when she designed? I am working the design for my enjoyment. Mary, you are a wonderful source of encouragement to all levels of embroiders. Wishing you a good recovery of health. Whatever I am, I certainly fall under the category of “determined.” I want to learn new stitches and techniques so will go out of my comfort zone to research them and do them. If I love a project I probably won’t give up unless I am convinced it is really far over my head. Even then though… I will do internet research, practice ,and talk to others who stitch whatever it is before I give up. Taking chances gave me the fun of trying and succeeding with the hummingbird project here called Enchanted Garden. I had never done such an elaborate surface embroidery project. In fact, I hadn’t done any surface embroidery since high school. But it all came back to me and it was fun! I guess I am a determined intermediate stitcher. These days I would consider myself to be well into Intermediate. I’m gearing up to do stumpwork, but I’ve never done, say, goldwork. I’m pretty good, but I’m not great, and I have more to learn. When I got into heirloom sewing, I was a Determined Beginner. Some friends had told me I ought to look at heirloom magazines, and I had, and thought that nothing more impractical could possibly be devised. But then…I saw a project of dresses designed for sisters. Similar styles with different colors and details. I was in love. I HAD to make those dresses for my girls. It took me 6 months. I learned about entredeux and bullion roses and lace insertion and pinstitching and roll-and-whip hems and I don’t even know what. It was insane for a total beginner to make those dresses, but they turned out beautiful! I am enjoying your site and the wonderful information you are presenting. The ‘Determined Beginner’ suits my situation really well. My interest is in bead stitching and I look forward to the news letters and reading past issues. Whatever label you put on yourself, you should never be afraid to tackle something that makes your heart beat faster. Chances are you will learn a lot and be ever so proud when you hold the finished piece in your hand. I remember the first project I ever made on my own. It was a pre-printed tablecloth of dubious quality, I had about 8 different strands of cotton available and no instructions (it was pre-internet time). I made a flower with the only 3 blueish shades I had and was ever so proud of myself, I will never forget the feeling. I still have that tablecloth and looking at it now I must say my technique was of course horrible and that particular flower is probably the most hideous thing in the history of embroidery. Neverteless it was, and somehow still is, the same source of pride to me as Kate Middleton’s weddingdress must have been to the ladies who worked on it. It is all a matter of perspective. I love the term “determined beginner.” I think that’s what I’d call myself. If I see a project I really like, in almost any craft, I’ll give it a try. I do like the labels as a general starting point, but I’ve done projects labeled “beginner” that confuse the heck out of me. The internet has definitely made me feel better about tackling projects that look like they’ll be above my level – I might have to go figure out how to do each and every step along the way, but with Google and YouTube I’m bound to figure it out. Though my mother was an accomplished needleworker and I had done some simple surface embroidery as a child and teen, other priorities took over my life for the next few decades. Then I saw a solid cross-stitched picture tha I wanted to make for my daughter and son-in-law. After that I did a number of cross-stitch pieces of various types and finally finished a surface embroidered piece I’d begun 35 years earlier(!). I had also purchased a Jane Nichols book on stumpwork, thinking that “someday” that would be fun to try. We moved into a multi-level house that had a fuse box located in a very conspicuous place, and I wanted too conceal it. We had no artwork of the right size and shape, and none of the patterns I had in queue was right either. I decided that this would be a good time to have a go at stumpwork. (At this point, I’d have classified myself as a determined advanced beginner.) I sketched out a design using the various elements I wanted to incorporate, hunted around for several weeks to accumulate the required materials, laced up my muslin-backed linen on a frame my dad had made me many years earlier, and with the excellent instructions in Jane’s book, began. It was every bit as much fun as I’d expected, and we’re very pleased with the result. I think it will always be my favorite piece of needlework. I think I would describe myself as a determined amateur. I’m not a beginner, but I know that there’s a whole lot still to learn, and even more that I have learned but need to practice in order to become proficient. I don’t usually choose projects by ability level, but because I love the finished result. And then I learn along the way. One could also have different levels of skill depending on the type of embroidery. I am confident in Cross stitch and a little less so in crewel or needle painting especially when it has Stump-work in it. For example: would it be easier to apply the wire after the embroidery, say, on the leaf Mary did in Late Harvest? Or, is this purely a matter of Choice? I also feel that your daily postings are my daily fix. You are the first one I read. Have been embroidering since the third grade, that means eons ago, all kinds of it, anything needle.fabric and thread are for me, including canvass. My work is decided by what I see and I like, be it needlepoint mini Persian carpets, or anything that pleases my eye. Joined the Trevelyon Cap project, never having done gold embroidery was the challenge for me. I have been wanting to do so Jacobean type work and will do so when I finish the cap. I love the project you are working on and maybe I’ll purchase the book. This is something that I do not like to do on line, I cannot see what all the projects in it are, I’d rather go on line and look at the British sites where one can download and makeup something more personal. Look forward to the work on this embroidery you are doing, it is beautiful,I like the idea of adding beads. I think “level” is really only important when determining what you want out of a project. Sometimes you want a challenge, you want to learn something new, and some times you just want to have fun and relax, or end up with new pillow cases. What I find really useful is a list of the techniques and stitches used. Ex. Goldwork, long and short stitch, beadwork, bullion stitches, etc. This way someone can check off what she knows how to do versus what she will have to learn for that particular project and decide if she wants to tackle it. I find this much better than skill level too because someone might be an expert in goldwork, but has never done thread painting will probably find this info much more helpful than a general skill level. Especially because a lot of the time it doesn’t say what the level pertains to. General embroidery skills, or the specific technique used in the project, i.e. “For Intermediate Embroiderers” or “For Intermediate Silk Ribbon Embroiderers”. If I took notice of any labels on my competency I would never continued sewing at all. I have several good stitch books, that show how to do a stitch. Today there is the web and people showing how to do a stitch. Yourself included. I have come a long way from first stitching a sampler to my thigh as a girl of 6. So I could say I started as very impressive. What I have learnt over the years that if I see a project I want to do I buy the whole kit. Can be expensive but it saves me going through the stashes and I can just get to the job. Gold work especially as I do keep some gold but what a nuisance going to see if I have the right thread. If I buy a pattern with out all the bits then the stash comes into play. Even so if I have not all the colours I will try and find a substitute from my stash. As for your beading flower Mary, I have to do it separately. I find as the bead gets harder to cover going through the fabric is just one more wall. I don’t like all the thread being pulled through the ground fabric as I think it weakens the fabric and could if that method is being used on something that gets washed/ used often, a weakness could appear. As Late Harvest is a framed work that is OK. Nevertheless, I still find it too hard pulling thread through the work. Pliers always at the ready. Even so it is horses for courses for each stitcher. All these little things we find out down the road of our embroidery journey. There are some styles I REALLY don’t like doing. I can appreciate the beautiful outcome but doing it is not my “thing”. Counted Cross stitch. Tanja has some lovely x stitch at the moment. The elephant is just about photographic. Elephants are a fav of mine but do that work. No way. So best advice to all those who want to start embroidery. Get a good “how to stitch – what stitch is that” book and just sew. Mary, Re your discussion on where to start your embroidery when working on an object. I wondered if Hazel Blomkamp is a left-handed embroider. I say this because I am left-handed, and I find working from the inside out much easier for me to understand and work, than the outside in. I also start stitches in the opposite direction to right-handers, which drives my right-handed family nuts. This is just a thought that occurred to me, when reading your blog, that may expalain why she works this way. I’m not a left handed embroiderer, very much right handed. My sequence, or method, of stitching is based on what gets the best results for me and having done it for long enough, I know what that is. Like needles. I do most of my embroidery with a size 10 quilters’ needle. Even bullion knots. Because that needle sits most comfortably in my hand. I was using other needles because I thought “I should”, got a repetitive strain injury and once it was no longer painful went back to using only that small needle. Along with physiotherapy and regular specific exercises, I think it’s helping. There can surely be no hard and fast rules for anything that is creative or hand made. To get the best results we all HAVE to work in a way that suits the individual. This is why Mary’s blog is so valuable to the whole stitching world. She shows that, so often, there is another way. Even though Hazel uses just one particular needle, by the way, she does include all the possible needles you might want to use in her kits, which is super helpful. Really, her kits are among the most thorough embroidery kits I have ever seen. I’m having so much fun with this project, Hazel! The grapes! Oh, the grapes! Now there’s a story about my making the absolutely wrong decision! I had to claw my way out of it. But I absolutely LOVE the grapes! They’re so fun and they’re so pretty. I go by what I love. I am not an experienced embroiderer having taught myself, but if I love something I buy it and take it on as a challenge. I look up the ways to do a stitch (usually on your site) and take the attitude that I can unpick if I’m not happy with it and try again. I love the idea of determined beginner. If something seems too hard I substitute. Embroidery is a hobby I love to do and learn. Not too involved with levels. More involved with the peace and joy from creating on fabric and on paper. When I started out knitting I went from one color, one stitch (garter), squares and triangles to knitting a Dalek. So I had to figure out knitting in the round, new kinds of increases, decreases, a new way to cast on, how to flip the work and stitch the opposite way from that cast on, knitting with two colors, and bobbles. I actually reached the bobbles while I was knitting at school and had to omit some of them as I was going until I could watch a video on it. I like to learn by doing something that I have no idea how to do over and over again until I figure it out. I AM curious as to how I would rate on the stitchery scale. Knitting I would say I’m an advanced intermediate, just tripping into advanced. But with embroidery, I’ve tried a lot of different stitches, but I rarely finish larger projects (or smaller ones for that matter) and none of it is all that good. I stay mainly with cotton thread on whatever-is-on-sale fabric surface embrodiery. I simply have to ask: a Dalek? As in Dr. Who? May I ask what it was for? (I have an image of a Very Unusual tea cozy!). I was a determined beginner when I decided that a stumpwork project was what I wanted desperately to do. When our guild offered a group project designed by one of our members I jumped in with all four feet. The finished piece hangs proudly in my livingroom. Doing that embroidery gave me so much confidence that I have never been afraid to try anything since. It was the best thing I ever did for myself as a stitcher. I was out yesterday so missed your really interesting post. What level am I, I don’t know I don’t really consider levels when I want and start a projects, I think to myself I really like that and go ahead and do it because I fall in love with it. There are many projects that I have done which I suppose are advanced and I found difficulites with them in the beginning but by “doing” you learn as you go along so the next time you embark on a similar project your know the pitfalls and can eliminate these as you go along. My favourite challenge was when I completed my goldwork projects which I thought I could never do, but, I finished them and everyone I showed said they liked them and I am not afraid of goldwork anymore. I just completed a fabric journal which I have never attempted before and I have to say it was difficult at first, I researched on the internet all the fabric journals available and collected lace, doilies etc and just started putting it together, although I was very nervous I have now completed my first fabric journal and I am quite proud of the outcome. So my philosophy is if you like it try it and go along with the mistakes the frustrations you will find along the way, but when you have gone through all the difficulties you will be proud of your success. Thanks for sharing your views on your project and for the discussion on the levels of embroidery very interesting. I hope you are well best wishes to you. Completely agree mary. Just need to add that you have to like going into details, enjoy what you are doing and want to progress in the technique you are learning. I am leading goldwork workshops and among the trainees, i have some ladies having never held a needle in their life and working far much better than other ones having a really large experience but who find the technique too difficult although i am sure they are completely able to do it. the beginners in my groups are some how more motivated by the real challenge for them while the other ones think it will be easy from the beginning and are desappointed by the fact that their experience is not enough to take it cool. They feel more frustrated than the one expecting nothing else than be able to learn, progress and just do it. Last but not least, the experienced ones do not listen to the advice as the others. They think they know it better but are disappointted with the result and then comes the time to ask them to start from scratch, leaving a bit of their experience aside, and to take the advice into account. One more thing i experienced : when you start with a kit, what ever is your level, read deeply the instructions, undestand them (correct them…) and do not hesitate to read more in the books or other supports you have about the technique you are going to learn or want to improve. There are really many videos on itube and enough comments on the net to learn by yourself from others experience. I hope you are doing well with your health and treatments mary. Do not hesitate to give us some info about that too. Thank you so much! Finally, I have a label in the World of Embroidery: ‘Determined Beginner’! Love and appreciate your generous advice, assistance and website! I have yet to find the courage to tackle a Hazel Blomkamp design and your motivation and guidance is helping me enormously along that route. I think so much depends on how good the instructions are, not your personal level. Example of inadequate instructions follows. I was looking at an old pattern I had saved and debating whether to keep it for future use. It is complicated, “The Ultimate Stitcher’s Showcase”. 8″x 14″ done on white hardanger with all white threads- DMC, Marlitt and DMC 8 & 12 pearl cotton and 16 Broder Special and Luinha. (a thread I’ve never heard of) Two threads for all stitches! There is about 1/2 page of pictures of numbered different stitches, a few combinations I’ve never heard of. Then on the next page, below the pattern (Which has #s)is a numbered list of which stitch to use on which part of pattern. I’ll probably never attempt it, but I like to look at the picture. No clue what magazine I tore it out of 🙁 design by Jude Martin & Vicki Sodawasser. I should send it to you! It seems that Hardanger is particularly subject to this lack of detail in the directions. I’ve purchased several samplers that have a Hardanger component, and as I’ve never done it before — and considering the investment in the “embellishment packs” — I’ve been somewhat reluctant to plunge in. Nordic Needle is THE Hardanger place, and I may order a couple of their books, but last night I searched for “Hardanger embroidery” on Utube and found a series that looks promising. I’ve not yet had a chance to view them, and with a new puppy diverting me from almost everything else (including sleep), it may be some time before I can. You might want to check them out, Pat, and maybe report back here. I see Nordic Needle also has a $25 DVD on Hardanger. I like the Determined Beginner level – gives a cue for the more adventurous personality types. When I started stitching in the pre-Internet era, instructions in kits and books were your main options, especially if you couldn’t afford conferences or your LNS didn’t have classes. If the item was designated as beginner, the instructions could be a bit pithy. The items designated intermediate or advanced tended to have more detailed instructions. “Translating” written instructions into visual-physical medium can sometimes be challenging. I still have some kit instructions because they had the best diagrams or explanations for executing certain stitches. Now with the Internet, we can watch videos or easily find many different stitch guides/explanations – accommodating different learning styles. For EGA or other conferences, I do find it helpful when a teacher lists the techniques or stitches that will be used in a project (as well as all the tools – definitions of “typical embroidery supplies/tools” vary by person). Then I can decide if I want to increase my expertise in an area or learn a new technique/set of stitches. So enjoyed today’s “level” thoughts. I have been embroidering since I was eight years old and never considered levels, if I liked the pattern I bought it and worked it out. My Mom started me on simple cross stitch on muslin and loved it. And, as an adult I fell in love with crewel and did several, one of which is still a work in progress with lots of detail. May never finish it but, it did broaden my skills somewhat. To date, I just do Red and Blue work for pillows, and quilts. Thanks for you input and for showing your beautiful works, awesome. I have quite a few fiber related hobbies, and I’m pretty sure I have never started a new hobby with a beginner project. It started when I learned to knit (BC, before computers). The first project I did was entrelac socks, which I found later wasn’t really a beginner’s first project.. but I didn’t know any better, so I just jumped in. Now I don’t feel like I have to start with beginner projects. I have taken many classes from EGA seminars and I am always amazed at the number of people who sign up for a class because they like the piece, but have no experience in the techniques required. These are people who monopolize the time of the teacher and will never actually finish the embroidery. It’s such a waste of resources. I applaud those wishing to learn a new technique however, when you take a class because you simply like what is being offered do your fellow students a favor and try something more to your abilities. I’m talking about crewel work, needlepoint, goldwork or mixed media. When a technique says advanced or intermediate/advanced and you know you are not yet at that level, admire those classes and try to learn something from a class that meets your own ability. Others in the class will appreciate it. I don’t normally let someone else’s perception influence my decision to work something, except for …goldwork when I allowed myself to be talked into a ‘beginners’ project when I thought I could cope with a more advanced one. The beginner’s project was pretty basic and I got bored with it. So I figure it is pretty dumb to let someone else decide what is good for you – you are the best judge of your own abilities and if it turns out you are wrong, well it’s simply another lesson learned. Right? It’s an interesting idea. Before I read your descriptions of levels, I thought, well I’m definitely an intermediate, but after reading them I thought, according to this I’m a beginner because I don’t know how to transfer a pattern (or, at least, I did it once not very well). But I’ve been stitching for years, granted 90% counted cross stitch, but I’ve followed one of your patterns from scratch, and I’ve done crewel embroidery, worked canvases in half-cross, and know more than the basic stitches. So I think I’m Intermediate even though I mostly don’t do what you call “surface embroidery”. I am one of those people you describe, the Determined Beginner, in some things. When I started to crochet, did I start with a big, thick hook, thick yarn and an easy afghan pattern? No. I was taken with a tea tray cloth pattern I saw in a magazine, crotcheted with a teeny hook, thin cotton thread, in WHITE!!! Well, I finished the project but I had to give it a thorough wash because parts of it were grey from having been unpicked and redone so many times. The same thing happened when I started to knit past the scarf/mittens level. I decided to knit a baby blanket for a friend. It was a circular pattern and it was a b****!! I hope that baby wasn’t adversely affected by the amount of cursing that went into its blanket. But now I can knit anything. So it pays off in the end. I think the idea of levels really depends on the personality of the stitcher. People who are easily discouraged maybe should take them into account, but I like your idea of determined beginner, or, for that matter, any other level. Craftsmanship is a matter of being willing to think about what makes a technique work, and if you are willing to do that and to practice, a human being can do just about anything they put their minds to. Next Next post: Gorgeous, Exuberant Crewel – Talliaferro is Back!